You’ve Made Your Caster Order, What Accessories Should You Consider? You just finished your caster order. You did all your research, and knew exactly what type of bearings, caster, and style you needed for your particular application. Congratulations. Now what? Now it’s time to look into the accessories that are available to compliment your caster order to help make your workplace more efficient and safer. Let’s take a look at some of the accessories that are available to you. The purpose of floor locks is as straightforward as the name explains, to lock whatever item the casters are being used on in place. Anytime there is a need to switch seamlessly between being in motion and being stationary, it’s important to know you have quality floor locks and the right style for your needs. Standard Floor Locks – The simplest style of floor lock available, the standard floor lock is attached to the bottom of your castered device and has a foot-engaged lock. This style of floor lock is intended for use only on flat surfaces. When finished, there is a bent bar you toggle to disengage the lock. Double Pedal Floor Lock – Similar in application to the standard lock, the double pedal floor lock differs in function. Just like you do to engage the lock, you can use your foot to disengage it on its double pedal releasing mechanism. 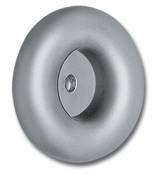 This style of lock is also intended for use on flat surfaces. 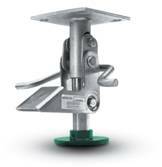 Adjusto-Locks – Intended to address the common issue of the first two locks, the adjusto-locks are used for locking on uneven or irregular floor surfaces. They can self-adjust to keep your device level despite the floor orientation. Lightweight, they also are made of aluminum which is resistant to many chemicals. 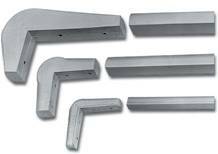 Heavy Duty Floor Locks – Made of cast iron, the heavy duty floor locks are intended for use on any device carrying larger, heavier loads. It is both foot activated and deactivated. Its finish allows for it to be resistant to corrosion and can hold up to 1,000 pounds. As careful as you try and be navigating your dollies, carts, beds, furniture, or whatever else you are using your casters on; it’s still likely you will bump into a wall or other cart while using. This is when you will want to use a bumper on your castered item. End Bumpers – This style of bumper is used primarily on tubular handles and are good at absorbing both shock and noise. Their simple design allows for them to be easily installed or replaced. Corner Bumpers – A more heavy duty bumper, the corner bumper would be affixed to the corners and impact areas on dollies, carts, and any other rolling devices. Since it is a high impact area, there is extra padding at the center corner as well. 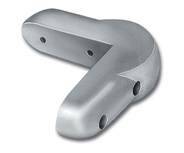 Strip Bumpers – An additional accessory to the corner bumper, these strip bumpers are added along the side of long devices. They are perfect if you need to make a lot of wide turns or deal with narrow hallways where bumping into the wall from the side is a concern. Whether you are looking for locks, bumpers, casters, or wheels, it is important that you are keeping the safety of your staff, customers, and facilities in mind. Not sure what combination of floor locks and bumpers would work best for your needs? Contact our representatives today and we can explain each of these accessories, and more, and which would best work for you! What Types of Caster Locks Are Available?